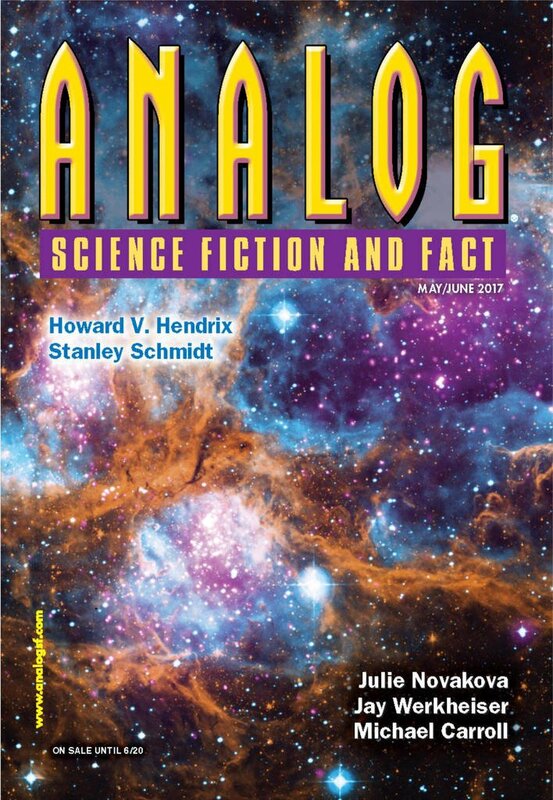 "A Grand Gesture," by Dave Creek [bio] (edited by Trevor Quachri), appeared in Analog Science Fiction and Fact issue 05-06|17, published on April 20, 2017 by Penny Publications. Pro: In a lot of ways, this is a traditional, hard SF plot: they have to find a way to distract the mother long enough to escape, using the limited technology at hand. Con: It’s impossible to believe Kayonga wasn’t jailed or executed after killing two humans to save a few animals. Much less allowed to continue to have a career. Or that anyone would work with him—under any circumstances—ever again. The fixation on saving the alien animals seems equally misplaced. Granted, they’re at least willing to kill them if required, but then that calls into question his reasoning on the previous mission, since there are four “beings” between the mother and her young vs. just two of them. The science is really, really bad. Just for a few examples: a hydrocarbon atmosphere will not ignite in the absence of oxygen. Balloons filled with helium would sink, not float, in Jupiter’s atmosphere. Sulfur is described as serving the same function as oxygen (which is true at high temperatures, but not on this planet) and then a sentence later as serving the same function as water (which makes little sense).